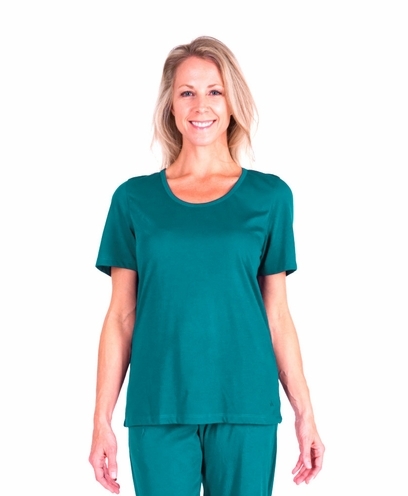 Style #T4955-C For classically styled sleepwear that also wicks away, this Mix & Match Scoop-Neck Wicking T-Shirt from Cool-jams™ is the perfect choice. This shirt is made with our unique Cool-jams™ smart fabric technology that is scientifically woven into each fiber of the soft, silky fabric, creating a comfortable fit that also wicks away moisture from the skin. Its scoop-neck and short sleeves have a classic look that pairs well with just about any other sleepwear piece, and it comes in a variety of attractive colors to help you to create a cohesive set. Not only is the Mix & Match Scoop-Neck Wicking T-Shirt a great option for those struggling with night sweats, it is also lightweight and wrinkle-resistant so that you can easily bring it with you while traveling. Stay cool and dry while at home or on the road with this innovative T-shirt. Note: The colors Violet and Turq-Sea are being closed out, so stock is limited in these colors. I never tried any of the cool jam items, after reading about the Jam shirts I thought I would give it a try.The shirt is very soft and very comfortable to wear and sleep in. My husband and I get very warm while we sleep. It doesn't keep you very cool, but it does wick moisture well, we do have a foam mattress so my guess is the the mattress might be the problem because it gets very hot. I may buy the Mattress protector to see how that works. Merchant's comment: You are correct. Foam mattresses are very very hot and the best thing to do for foam mattresses is to use cooling mattress pads and sheets. Testing shows that Cool-jams sleepwear will keep you a few degress cooler than conventional sleepwear, but the pjs are not going to feel like air conditioning. Unfortunately is difficult for a single t-shirt to counter the effects of the hot foam mattresses. I'm glad the t-shirt is wicking moisture and drying quickly as it is supposed to. The t-shirts work better for someone who gets overheated internally...not necessarily from hot uncomfortable bedding and mattresses. Hope this helps. I WAS BUYING COOL JAMS YEARS AGO (DON'T KNOW HOW FAR BACK THE COMPANY KEEPS RECORDS), SO I KNEW I WOULD BE GETTING A QUALITY PRODUCT. I'M STILL WEARING PINK NIGHTGOWN WHICH WAS MY FIRST PURCHASE.